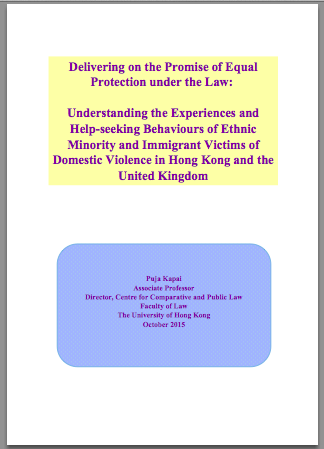 Press Release: "HKU Empirical Study on Help-Seeking Behaviour of Ethnic Minority and Immigrant Victims of Domestic Violence Reveals Institutional Incompetence of Frontline Responders"
Existing protections and institutional capacities to effectively combat domestic violence continue to be challenged by cultural and religious frameworks that predominate individuals’ private and public lives. Inadequate attention to the differences in value systems (internal factors) and personal circumstances that impact the capacities (external factors) of ethnic minority or immigrant victims to access relief measures effectively forces the women to live at the peripheries of society, in isolation and grossly vulnerable to future violence and at risk of falling through ‘the justice gap’. The Director of Centre for Comparative and Public Law at the University of Hong Kong, Ms. Puja Kapai, critically examined the assumptions underlying existing laws and policies governing protection against domestic violence in a recent Study. Upon an intersectional impact assessment and analysis of the responses of 100 participants, the findings in the Study bear out the importance and indispensability of accounting for factors that impact help-seeking behaviour of ethnic minority and immigrant women, including race, culture and religion, language barrier, financial dependence on their partners, immigration status, their perceptions of the legal system and frontline responders to domestic violence, and lack of relevant legal and practical knowledge. Furthermore, institutional incompetence of frontline responders on multiple levels often deters ethnic minority victims from seeking help from existing resources when they face domestic violence. The study was presented at a HKU seminar on 3 October 2015, deputations were made in the Legislative Council on 6 October 2015 and a press conference with legislator Fernando Cheung and others was held afterwards. For media coverage of the report and its impact, see on.cc (Chinese), EJInsight, immediahk.net (Chinese), yahoo (Chinese), Hong Kong Standard, South China Morning Post, and FinTV (Chinese) . To download the report's executive summary, click here, and to access the submission to the Legislative Council, click here. Good afternoon! I am very interested in this finding. May I know where can I get the full report of the above study? Many thanks!